It’s a basic physical law that what goes up must eventually come down. 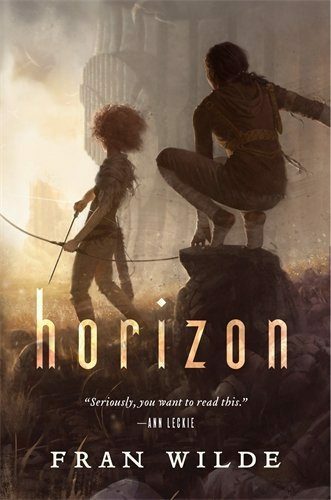 Though Horizon, the third and final book in Fran Wilde’s Bone Universe series, and Echoes of Understorey, the second volume of Thoraiya Dyer’s Titan’s Forest trilogy, are both very different narratives, they share a thematic emphasis on this tenet, and one which is worth a comparative exploration. In the first two instalments in Wilde’s Bone Universe, we’re introduced to Kirit and Nat, best friends who live high in the air in a city of living bone towers where citizens fly with the aid of wingsets. Nobody flies below the clouds, and the biggest threat comes from fearsome, invisible, flying squid-like creatures, called skymouths—or so the friends initially believe. But when Kirit is taken to join the mysterious Singer order in Updraft, she learns the darker secrets of the city—truths which, once revealed, shatter the established order forever. The start of Cloudbound finds Nat struggling to repair the social fallout of Kirit’s revelations, a decision which initially puts him at odds with his friend. But by the end of the book, both they and their allies have discovered the biggest truth of all: that their city’s spires grow, not in a bone forest, but from the back of a massive creature so overburdened by them as to now be near death—and that they must brave the ground to find a new home. Likewise, Dyer’s debut novel, Crossroads of Canopy, introduces us to the segregated, forestbound civilisation of Canopy, ever-fearful of those who live in the darkness of Understorey despite its wealth and reliance on Understorian slaves. Canopians know the ground, which they call Floor, exists: they just don’t go there, content to remain in Canopy where their living gods can protect them. The gods, however, are vulnerable when their mortal avatars die, and in the first book, protagonist Unar’s search for the next incarnation of Audblayin sees her questioning everything she knows about the world that raised her. 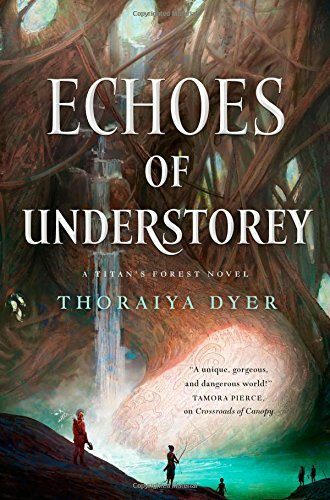 Echoes of Understorey takes place in the aftermath of Unar’s choices: for Imeris, raised in Understorey alongside a sister who now lives above as the goddess Audblayin, the question of belonging is not so simple. Imeris has spent her adult years planning to take revenge on one of Canopy’s enemies—the renegade sorceress, Kirrik—by honing her skills with Understorians who train to raid the world above. Imeris doesn’t want Canopy destroyed, but neither does she want Understorey to remain subjugated—and if an Understorian cannot go up, where else can she look but down? Both literally and figuratively, Horizon and Understorey are novels about the consequences of a culture forgetting its roots. For generations, the people of Nat and Kirit’s city have been growing their bone spires higher and higher, their knowledge of the behemoth beneath them steadily forgotten, until only faint references to a “bone forest” remain. This ignorance is what causes them to overburden and ultimately kill the very creature on which they and their culture depend: for all that the citizens willingly threw down lawsbreakers to appease the city whenever it “rumbled,” the actual point of the action—offering food to a hungry beast—was forgotten, replaced by faith and ritual. Similarly, the citizens of Canopy have little to no knowledge of Floor, while their whole society—the magical barrier which protects them from those living lower down; the range and efficacy of their gods’ powers; the luckless raiders they take as slaves—is predicated on the subjugation of Understorey. As a people caught wholly in the middle, denied safe access to Canopy and Floor alike, yet subtly dependent on both extremities in different ways, Understorians give their children palindrome names—like Ylly and Imerissiremi—in the hope that they, too, are able to travel in both directions. It’s this goal which Imeris ultimately strives to fulfil: she wants to be free to reconcile the two parts of her heritage, not forced to choose or to make herself exceptional through great deeds. But when her quest for Kirrik leads to her entanglement with Anahah, the fugitive servant to a Canopian god who has his own dreams for freedom, her ambitions become at once more complex and more personal. The respective heroines of Updraft and Crossroads, Kirit and Unar, both start out fiercely determined to excel in their worlds: Kirit by earning her wings, and Unar by becoming the next bodyguard of the goddess Audblayin. These ambitions are derailed, however, when each young woman falls out of step with the social expectations of those around her—by asking questions, by showing compassion, by sheer bad luck—and is forced to handle the consequences. Even then, both Kirit and Unar initially try, in their own different ways, to redeem themselves in the eyes of their societies, mostly due to a sheer, pragmatic desire to live, but also because the systems which have now turned on them are the systems in which they’ve been raised, so established and so seemingly insurmountable that, even as the scales fall from their eyes, the old desire to please—to excel—remains. The extent to which both Kirit and Unar consider themselves exceptional is a function of their status as protagonists: we’d hardly be reading about them if they weren’t going to change their worlds. Nonetheless, within their respective contexts, their self-perception as exceptions to the rule is as much a consequence of how quickly their worlds have turned on them as it is a display of stubbornness or ego. All their lives, they’ve been taught that the rules work a certain way, to a certain purpose, for the protection of those who are worthy; and having been taught, right up until their moments of downfall, that they were worthy, each girl believes that her actions—showing kindness to outsiders; defending herself from malicious authority; acting on her ambitions—must therefore be worthy, too. Demonstrably, neither girl is hurting anyone: more often, in fact, they act to shield others from pain. But having been, if not the most privileged beneficiaries of their social orders, then at least accepted within them, it’s not until they are fully considered outcast that they realise the system is rigged to view even compassionate deviation from the norm as harmful to that norm, such that submission to authority, not justice, is revealed as the highest guiding social principle. Nat and Imeris, by contrast, perceive themselves as standing off to the side of exceptional people, struggling to live their own lives, on their own terms. While each has a quiet desire to improve things for their fellows, they don’t dream of greatness, like Kirit and Unar, but of a life where no great acts are required to make their personal happiness possible. It’s for this reason that both of them invest in social institutions which ultimately betray them, just as Kirit and Unar were betrayed: Nat by his political mentors, and Imeris by the Loftfol school that trains Understorian raiders. In each case, though for very different reasons, both characters have reacted to the onset of social upheaval by trying to quietly use their available institutions to facilitate personal change. In Nat’s case, he finds that the Tower politicians are so busy trying to reassert their power that duplicity in their ranks—to say nothing of the wider, most fundamental cause of their problems—is going unchecked. For Imeris, things are different: having availed herself of the Loftfol school’s methods for so many years in pursuit of her own goals, she becomes detached from the reality of their commitment to destabilising Canopy. That being so, there’s a certain asymmetry inherent in comparing the third book of Wilde’s series to the second book of Dyer’s, as each volume in each trilogy is intended to pair a physical location—spires and Canopy, midcloud and Understorey, ground and Floor—with a progressive, thematic descent through the stages of social change. By this rubric, it’s Cloudbound, the second Bone Universe novel, which pairs more neatly with Echoes of Understorey, as both books follow secondary characters from the previous novels—Nat and Imeris—as they navigate societies shaken by the actions of Kirit and Unar. Just as Nat spends his book travelling between the spires and the midcloud, uncovering new truths about his home, so does Imeris move between Canopy and Understorey. Their personal arcs, however, are markedly different. Whereas Nat has a vested interest in trying to repair his society, at least initially, Imeris has always been an outsider even in Understorey, her unique family circumstances necessitating a secretive childhood. As a baby, Imeris fell from Canopy to Understorey, where she was raised by three fathers and three mothers alongside her sister, Ylly, none of whom are her biological relatives. Imeris’s quest for retribution sees her shanghaied into the service of Canopian gods while still helping Anahah, an enigmatic former bodyguard, to flee their justice—and, eventually, to a meeting with her Canopian blood-kin. At the same time, the practical concerns of Horizon—most notably, the Herculean task of first convincing those above the clouds of the need to flee, and then getting everyone down to the ground—pair neatly with those of Echoes of Understorey. This emphasis on details is underscored by Wilde’s decision to make Macal, a minor character from the first two books, a third narrator alongside Nat and Kirit. Where Kirit acts through defiant iconoclasm and Nat through a desire to save his loved ones that steadily expands to encompass their whole people, Macal has always belonged to the Towers and their institutions. As such, it is predominantly Macal who manages the many pragmatic aspects inherent in relocating an entire settlement from sky to ground, including uniting warring factions and convincing them to heed the danger in time. In this sense, Macal is a selfless character, one who ultimately sacrifices everything to help others survive; but that sacrifice is only possible because of Kirit and Nat, whose rule-breaking and revelations enabled him to act. Similarly, while the ending of Echoes of Understorey is brought about thanks to Imeris—an unprecedented meeting of Canopian gods, discussing how best to care for their mortal charges—her actions are only possible because of Unar, whose iconoclasm paved the way for a different sort of change. Forwards and backwards, up and down, across and through. Wilde and Dyer show us their respective cultures from every angle, not only for the sake of worldbuilding, but to demonstrate the necessity of social change encompassing every aspect of a society. The fact that their worlds are likewise effortlessly diverse, featuring a range of queer, disabled and POC characters, along with polyamory and, in Dyer’s case, an upending of cisnormativity, is materially relevant to this point. Denying the relationship between the world we inhabit and the worlds we create makes as much sense as claiming not only that a child’s behaviour has nothing to do with their family, but that parenthood doesn’t change you in any way. Even in writing about fictional axes of oppression, Wilde and Dyer still make sure to entangle these with real ones, using the intersection of fiction and reality to make compelling points about both. In Echoes of Understorey, former bodyguard Anahah is forced to flee the wrath of the bird goddess, Orin, when he uses the gift of shapeshifting she bestowed on him for his own purposes. Imeris helps him without knowing the exact nature of his “crime,” but when the reveal comes, it’s powerful: lonely and longing for family, Anahah has used his gift to grow a womb and conceive a child of his body, and for that, Orin wants him dead. Imeris fights to keep him free, and when the eventual child is born, the three of them become a family, deciding to make a new home for themselves in Floor. This commingling of bodily autonomy and geographic freedom is also present in Horizon, but from a fascinatingly reversed perspective. Having realised that their spire-building on the creature they call a city has ultimately caused its death, Kirit, Nat and their allies are forced to confront the morality of whether or not to colonise another such creature. The discovery of other inhabited behemoths whose citizens never built so high or so carelessly suggests that a more symbiotic relationship is possible; and yet the one such culture they encounter are also, as Kirit puts it, “city-killers,” hunting the other behemoths for reasons rendered impenetrable by a language barrier. But Kirit’s whole society is founded on the ability to fly, which is impossible at ground level. Is the preservation of their culture more important than the behemoth’s right to live? In the end, the question is split: when a newly hatched city is found, some stay behind to nurture it, the better to rebuild a more mutually beneficial version of their old world, while others, like Kirit and Nat, go forth to make a new one. Outside the window, a cluster of nuts chewed free by a cockatoo spun through the air, destined to fall through Canopy and Understorey on its way, inevitably, to Floor. As we prepare to fly, Ciel’s and Elna’s voices drift from a neighbouring kite, raised in song. Verses familiar and new follow the breeze, describing our fall, our rise. We sing to remember and to teach. We weave new worlds with old. We lift on the wind. We soar. In terms of style and audience, Wilde and Dyer are very different writers. Where the Bone Universe is pitched as YA, the Titan’s Forest trilogy is aimed at adults, and while it’s always difficult to describe the subtle differences that distinguish one author’s prose from another’s, both have distinctive voices. But thematically, there’s a lot to tie the two series together, and a great deal to recommend reading them both individually and in concert. Though Horizon marks the final book of Wilde’s series, there’s one more to come from Dyer, and I have every faith that it will live up to expectation. Through clouds and canopies, bones and boughs, plains and floodplains, the compelling heart of SFF shines through in these novels—the potential, not just to invent new worlds, but to render them as capable of change as we are.